Learn how to photograph the Northern Lights! Are you a fan of the Aurora Borealis, the Northern Lights? We are very proud to be able to offer now a three day expert tour to see, understand and photograph this incredible spectacle in the Nordic winter skies. Our Exploring Iceland Aurora experts are experienced guides with vast knowledge in the aurora and how to photograph this beautiful natural phenomenon. This tour takes us to the marvelous Snæfellsnes peninsula, often called “Iceland in a nutshell“ for its variety of landscapes. Here we have all the attractions of Icelandic nature in a confined area: a beautiful shore line, volcanoes, craters, steep cliffs, green meadows and of course Snæfellsjökull, the fascinating glacier-capped volcano – famously known from Jule Verne´s Journey to the Center of the Earth. Every day we go for easy walks to embrace the beauty of this incredible landscape. ​At night we go out to hunt and photograph the northern lights under expert guidance. This area is especially well suited for Northern Lights hunting since there is hardly any light pollution. Accommodation: 2 nights at Snæfellsnes peninsula. Nights in Reykjavik can easily be added to the program. Guide language: Upon group´s wishes. Pick up at 6 pm at your accommodation in Reykjavík. When arriving in Iceland on the same day, please make sure that your estimated arrival time at Keflavík International Airport is no later than 4.30 pm. An airport bus www.flybus.is offers a convenient shuttle directly from Keflavík Airport to the BSÍ bus terminal. The city center with cafés, shops and museums is within easy walking distance from the BSÍ. Luggage can be safely stored for a small fee at the BSÍ bus terminal. At 6 pm Meet & Greet with your guide and bus drive via Borgarnes village to the Snæfellsnes peninsula. Check- in and dinner at the hotel and northern lights spotting during the evening under professional guidance. Today we will spend the whole day in Snæfellsnes National Park with lots of leisure walks with stunning views. Snaefellsjökull National Park extends all the way down from the glacier-capped volcano - famous for Jule Verne´s Journey to the Center of the Earth - to the rugged coastline. Declared a National Park in 2001, the area has an astonishing variety in natural landscapes including moss covered lava fields, pebbled beaches and imposing rugged bird cliffs. The jewel of Snæfellsjökull National Park is undoubtedly Snaefellsjökull glacier itself, which covers a dormant volcano that last erupted in 250 AD. 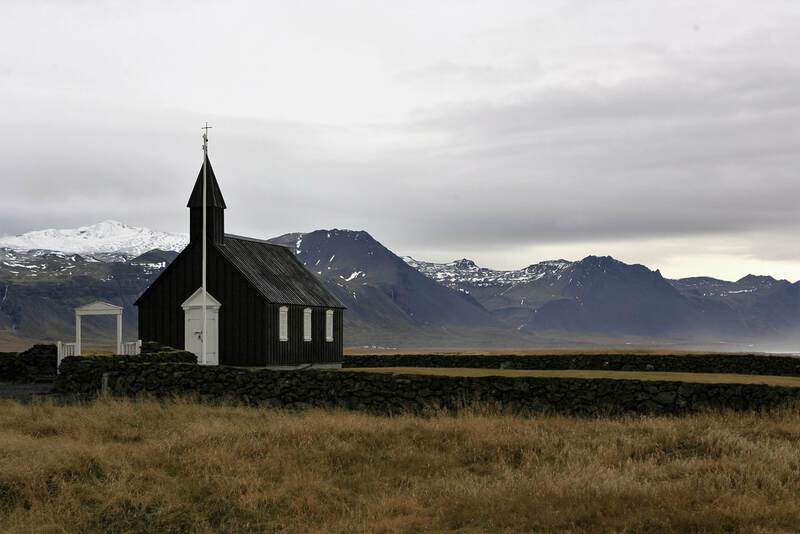 The area is known for its history and literature such as the stories of Guðriður Þorbjarnardóttir, an Icelandic woman who traveled extensively around the world in the Middle Ages and giant Bárður Snæfellsás. Today´s route takes us into the beautiful area of Borgarfjörður. We visit the charming Hraunfossar lava waterfalls, the mighty hot spring of Deildartunguhver and Snorrastofa, the museum dedicated to the medieval poet and statesman Snorri Sturluson, author of the famous Snorra-Edda. At the lovely Húsafell hotel we stop for lunch. After lunch you have the choice of two caves – either visiting a lava cave (included in tour price) or going for the optional Into the Ice tour upon Langjökull glacier. With a modified monster truck you will be driven up on the glacier to walk for half a kilomenter in the man made tunnel to see the stunning blue ice. For those preferring the lava cave we will only go for a short drive by bus and for a little walk to visit Viðgelmir cave a lava tube in Hallmundarhraun lava field which was formed around 900 BC. Víðgelmir is 1585m long and the largest part of the cave passage is 15.8m high and 16.5m wide, making it by far the largest of its kind in Iceland. Evidence of human habitation, probably dating to the Viking Age has been discovered in the cave and is preserved in the National Museum of Iceland. Lava tube caves are formed when a low-viscosity lava flow develops a continuous and hard crust which then thickens and forms a roof above the molten lava stream. When the eruption subsides, the still molten lava moving beneath the crust will continue to drain downhill, leaving an open lava tube cave. 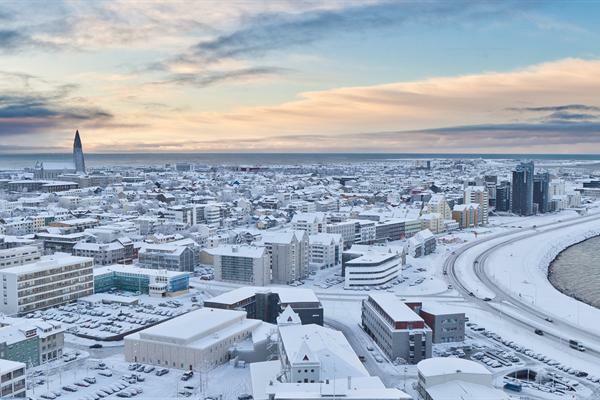 Return to Reykjavík in the afternoon and drop off either at BSÍ bus terminal or at your accommodation in Reykjavík. Guided bus tour and Northern Lights hunt with expert guide. Entrance to Snorrastofa and Viðgelmir cave.